As one, we gasp. Each of us holds in our hands a grainy black and white photo of our Dad, gone now for five Christmases. In the photo he grins out at us, so filled with youthful assurance that it still shines through, some seventy years after the moment. There he is, maybe sixteen years old, one arm casually draped around each of his parents. He is slim and strong, and happy. My heart clenches, then begins to pound. Tears fill my eyes. I have so many reactions all at once, but everyone in the room is talking now; I don’t know what to say or how to say it. The picture is a treasure, in so many ways. “He looks just like me”, I think. I miss him so much that a little spurt of anger flies through me: I want to show the photo to him! I want him to comment on how much I take after him. “MammaNonni looks so content. Her baby boy is beside her”, I think. My mind turns quickly to my own youngest son, absent on this holiday. My eyes take in the setting of the photo; the familiar grape vines behind the family, draping down the arbor fence. The old potting shed over PappaNonni’s shoulder. I can smell the grape leaves, and the sharp pungent tang of the tomato plants that I know were growing in rows behind the fence. I know just where the cameraman was standing, can feel my feet on the cement walkway and picture the back door just to my right. I have so many questions! How old were you there, Dad? What was the occasion? As the youngest of twelve children, it was the rarest of events for my father to be photographed alone with his parents. Why were they posed this way? Was it his high school graduation, maybe? It looks like a summery day. Who took the picture? What year was it? The voices of my family swirl around me, asking the same questions, making guesses about the answers. I hold the photo like a priceless artifact. I search my father’s face, looking for signs of my sons. Finding them. I share my father’s dark eyes and round chin; the shape of his smile can be seen in mine. I see hints of him in my son Matt, in his manner and his facial expressions. In the shape of his face and jaw. But it is my son Tim who seems to be echoed back to me in this picture; filled with life and eagerness, quick to embrace, quick to grin. Ready to take on the world. Dad, I wish you were here to see your grandsons, all of them so much like you! I wish you were planning to dance at your granddaughters’ weddings. I wish you were here to laugh at this photo and to tell us stories about your parents. I wish you were here to reassure me that I really do look a little bit like you. Liz; thank you! I am positive that you were right. I am absolutely certain that Dad was with MammaNonni and PappaNonni on Christmas eve, grinning with delight, filled with love, sure of whatever comes next. Buon Natale, Dad. That photo is such a treasure. Thanks for sharing how much your dad means to you. My brothers and sisters and I are getting to the point where we are the oldest generation alive in our family and it is a strange place to be in life. Our parents are old; our aunts and uncles are either dead or getting really old. I’m not sure I like it, but I’m certain I can’t do anything about it. I know! My sibs and I are in the same place. My advice? Take tons of photos; bring your kids along to all the interactions with the older generation. Cherish right now. Thank you, Lynn! My Dad is very much “with” us, every day. We all just wish we could talk to him, hug him, have a meal with him one more time. My sister, in her incredible wisdom, also gave a copy of the photo to all of Dad’s grandchildren. So cool! 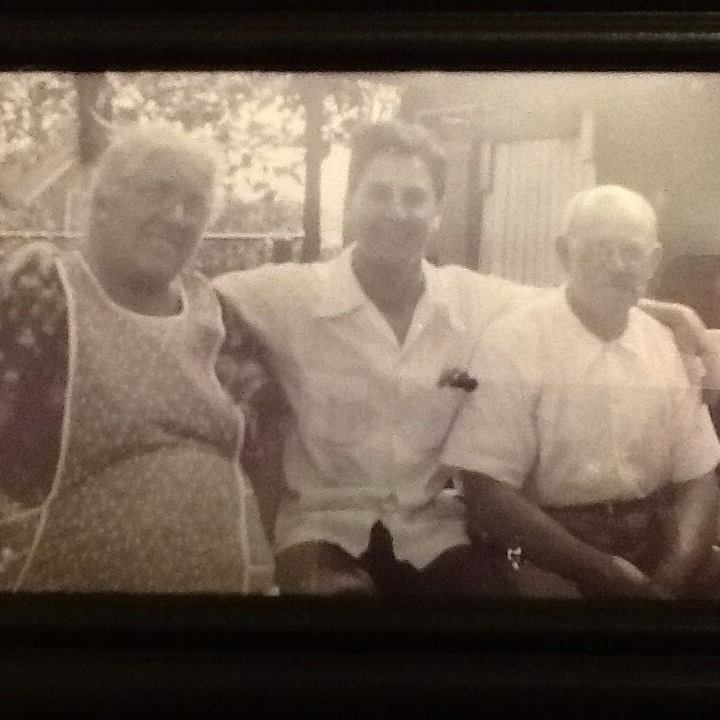 Every time I see an old family picture I have so many memories pop out … Sometimes, I look and it’s ME … but it isn’t me. It’s Aunt Kate or my mom and I’ve gotten to look just like them. Happy New Year. Let’s hope for a really good one. Happy and Healthy New Year to you and to yours! Looking forward to more of your writing in the coming year! Not really a gift, but a treasure. I have tears in my eyes. Such live, throughout the generations. Your likeness to him is unbelievable. You’ve brought tears to my eyes once again my friend. Beautiful post. He was way cuter than me, but thank you, darling! I am sure it was Dad who pointed me to that old memory box in my basement, and to the small wallet full of old high school photos, and that one little tiny black and white of he and his parents….telling me that while he still wishes he was here with us, he is also happy to be there with his arms around his parents shoulders again….the circle never ends. Just really glad to have you in my circle, Lizzie…. Wow… even with the graininess, I can see your dad smiling out at us all. Thank you for sharing such wonderful memories – and kudos to Liz – best gift ever. Hope all is well and Happy New Year. Happy New Year to you, dear friend!!!! How is your Dad doing? What a beautiful gift! My dad’s presence was felt at our Christmas gathering this year, too, and the lack of his physical presence was also noted. Thank you for sharing such a lovely story. I was thinking of all of you, knowing that you would feel your Dad looking over your shoulder the whole time….